Late last year, Microsoft surprised many with the announcement of the Surface-branded headphones. The premium peripheral has opened the door to the company exploring where else they can apply the Surface branding and the next stop appears to be a pair of earbuds. According to multiple sources who are familiar with the company’s plans, Microsoft is currently working on a pair of earbuds under the code name of Morrison. The company is looking to capitalize upon the development of its audio tech by expanding its portfolio to cover the two major categories of headphones: over-ear and in-ear. This isn’t Microsoft’s first adventure into the earbud segment, the company previously sold earbuds with its Zune music player several years ago. 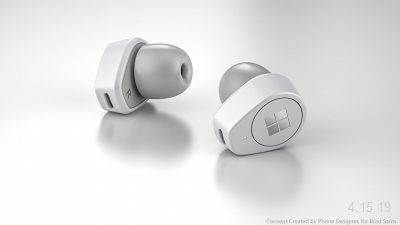 And with wireless earbuds being a quickly growing segment with Apple leading the way and Amazon likely joining the party soon, Microsoft will be entering a saturated market but that has never stopped them in the past. The codename for this product is a bit different than others we have seen come out of the Microsoft camp when it comes to hardware. There are devices like Andromeda and Centaurus that use astrological names but the original Surface Headphone name was Joplin – likely related to Scott Joplin (or actually, Janis Joplin), an American composer known for his ragtime music. Morrison is likely related to Jim Morrison, who was the lead singer of the Doors and is considered to be a classic American rock star. As for the name, Surface Buds has been tossed around but I don’t know if that will be the retail name when they do arrive. Follow this and more on OUR FORUM.